Payment - Credit card payment is required for online registration. No cash refund will be made if notice of cancellation is received by the IADC office thirty (30) days or less prior to the first day of the meeting. Refer to your 2019 Annual Meeting brochure for full registration cancellation policy. 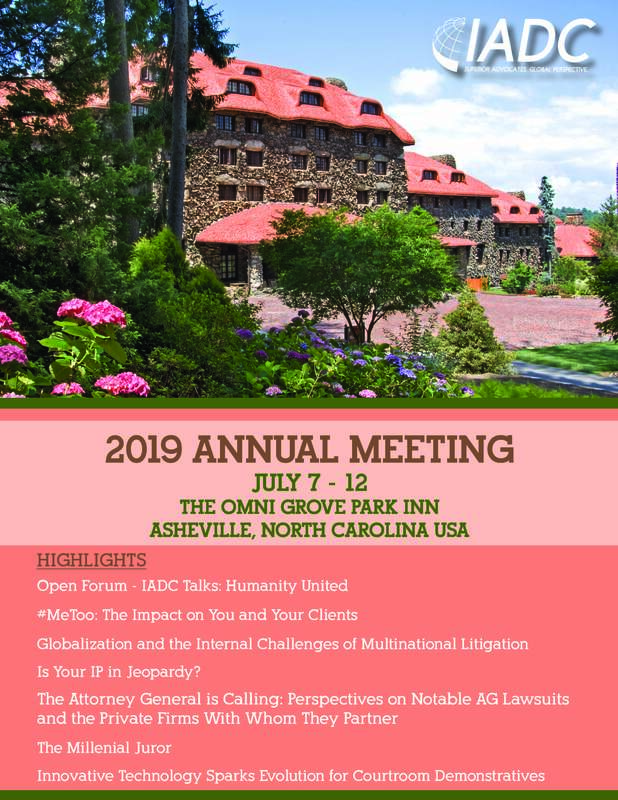 Member, Non-Member and Emeritus Member, Corporate Counsel/Insurance Executive (FULL MEETING Registrants), Spouse/Significant Other/Adult Guest/Adult Child: Fee includes breakfasts, Welcome Reception, Theme Party, Gala, various receptions, Committee and CLE meetings, and meeting materials. To register someone in addition to yourself under this category, please e-mail Maria Juarez, Registrar, at mjuarez@iadclaw.org. Two-Day Corporate Counsel and Insurance Executive Package(for corporate counsel and insurance executives ONLY): Fee includes breakfasts, Committee Meetings, CLE programs, and any events for general attendees on any two consecutive days of your choosing. Senior and Junior Children: Fee includes breakfasts, the Welcome Reception, and Theme Party. *Spouses/Adult Guests who would like to receive CLE credit must register as a Non-Member Lawyer. *Registration fees required for all Adult Children. Registration fees required for three oldest senior and junior children; additional senior and junior children and children under 5 are free. If you have questions regarding registration or to be put on a waitlist for events that are full, please e-mail or call IADC Meetings Registrar, Maria Juarez, at mjuarez@iadclaw.org or 312.368.1494. Are You Interested in Being a First Timer Host? This category is not for business associates. Spouses or adult guests who would like to receive CLE credit must register as a Non-Member Lawyer. Fee includes breakfasts, Welcome Reception, Theme Party, Gala, various receptions, Committee Meetings, CLE Programs, and meeting materials. Fee includes breakfasts, Welcome Reception, Theme Party, Gala, various receptions, General Programs, and meeting materials. Registration fees are required for all adult children. Fee includes breakfasts, Welcome Reception and Theme Party. Registration fees are required for three oldest senior and junior children; additional children and children under five are free. To take advantage of these complimentary registration fees for additional junior and senior children, please submit a hardcopy registration form to mjuarez@iadclaw.org. Registration for children under five is complimentary. For spouse/sig other/guests of corporate counsel and insurance executives attending with a two-day corporate/insurance package. Fee includes breakfasts, Committee Meetings, CLE programs, and any events for general attendees on these two consecutive days. Fee includes greens fees, cart rentals, boxed lunch, bottled waters, prizes, and tournament costs. Additional rentals will be charged to the individual. The PER PERSON fee includes greens fees, cart rentals, boxed lunch, bottled waters, prizes, and tournament costs. Additional rentals will be charged to the individual. Fee includes court fees, tennis balls, and bottled waters. Additional rentals will be charged to the individual. Fee includes tournament costs, court fees, tennis balls, bottled waters, and prizes. Additional rentals will be charged to the individual. The registration fee includes a boxed lunch, all necessary equipment, roundtrip transportation, and guides. MUST BE (8) YEARS OLD OR OLDER. The registration fee includes roundtrip transportation, lunch, entry fees, and a guide. For children ages 5-10. The registration fee includes roundtrip transportation, entry fees, dinner, and adult supervision. For children ages 10-17. Registration fee includes roundtrip transportation, dinner, entry fees, and adult supervision. The registration fee includes a boxed lunch, all necessary equipment, roundtrip transportation, and guides. MUST BE IN MODERATE TO GOOD PHYSICAL CONDITION, BETWEEN 70 AND 250 POUNDS, AND (10) YEARS OLD OR OLDER. See full description on page 13 of the Annual Meeting brochure. For children ages 10-17. The registration fee includes roundtrip transportation, entry fees, dinner, and adult supervision. For children ages 5-10. Registration fee includes dinner, crafts, entertainment, activities, a movie, and adult supervison. Must be 21 years old. Registration fee includes roundtrip transportation, lunch, beer samples, and a guide. Registration fee includes roundtrip transportation, equipment, snacks, and beverages. For children ages 5-10. Registration fee includes dinner, crafts, entertainment, activities, a movie, and adult supervision. For children ages 10-17. Registration includes dinner and adult supervision. Tweens/Teens will join their parents for dancing at the Gala following this dinner. If you have never registered for an IADC meeting before, create a new account. © International Association of Defense Counsel. All Rights Reserved.